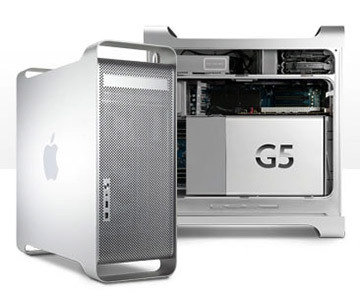 The Power Macintosh "Power Mac" G5 quad core (2.5 Quad) has at it's heart a pair of dual core 2.5GHz PowerPC 970MP "G5" processors with "Velocity Engine" vector processing, 8 FPUs, 1MB of level 2 cache per core along with a dual bidirectional 1.25GHz frontside system buses. 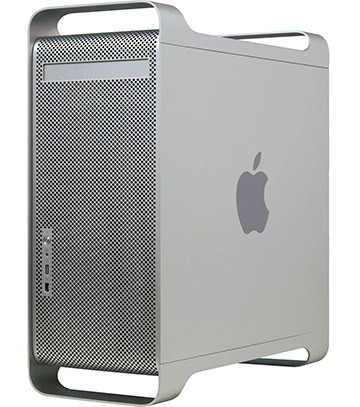 The base configuration has 512MB of DDR2-533 (PC2-4200) SDRAM installed as a pair of 256MB DIMMs, a 250GB/ 7200 RPM SATA hard drive plus a "16X" dual-layer "SuperDrive" plus an NVIDIA GeForce 6600 video processor with 256MB VRAM plus 3 available PCI-Express (PCIe) slots. Ports and connectivity come via 1 USB 2.0, 1 FireWire 400, 1 FireWire 800, 1 single-link DVI, 1 dual-link DVI port, optical digital audio in/out, a pair of Gigabit Ethernet ports plus support for AirPort Extreme (802.11g) and Bluetooth 2.0+EDR.